You wouldn’t be the first person to fall in love with Campania. This geographically stunning place has been magnetic for millennia. It was here, specifically from the island of Capri in the Bay of Naples, that Odysseus mythically heard the sirens singing to him. (Less mythically, the Bay of Naples lured exploratory Greeks of the 9th century BC to set up their first colonies in Italy.) To the ancient Romans, Campania was ‘the happy land’ (campania felix), and for holidays or retirement there was nowhere they prized more highly. 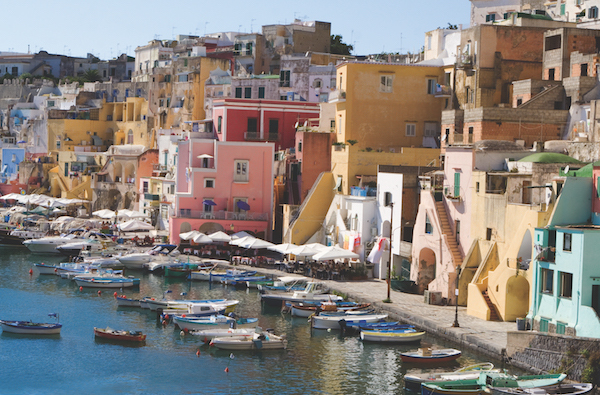 Glamorous, colourful and romantic, Campania has never waned in attraction since. When modern European tourism flickered into life, Campania was a chief target – mainly thanks to the 18th-century discovery of the buried ruins of Pompeii. “See Naples and die!” roared the young English gentlemen making the Grand Tour, convinced that until you had beheld the exotic glories of Campania you hadn’t truly lived. Enthusiasm continued throughout the 19th and 20th centuries, with artists and celebrities surrendering to Campania’s sensuous delights – the wind tousling their hair as they cruised the Amalfi Drive, the sun bronzing their limbs as they lazed on the rocks of Capri or Ischia. Today, Campania remains one of Italy’s most visited regions. Visited by outsiders for so many centuries, Campania is notably the source of many enduring stereotypes about Italy. The people here are excitable and voluble, they drive recklessly and embrace life to the full. 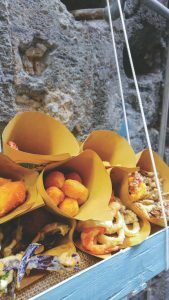 The region’s food is unforgettable, with the fantastically fertile soil bequeathed by Vesuvius yielding unrivalled fruit and vegetables. Italy’s best lemons, best tomatoes and best pasta are generally agreed to come from Campania. Meanwhile, ice cream, pizza and mozzarella are each local inventions that arguably still reach their apex here. The Campanian climate is warm and luxurious, and its fruit and flowers growing in frenzied abundance. There’s fragrance all around and music in the air. Campanians – especially Neapolitans – are famous for spontaneously bursting into song. Inevitably, there are a few downsides. Parts of Campania, notably Naples and its surrounding area, are very densely populated. A large regional population combined with millions of delighted tourists can make for a very crowded place at times. Competition for property, meanwhile, naturally means high prices in some urban and coastal areas. Lots of inhabitants also means lots of industry to keep them in jobs. Bits of ugly heavy industry, as well as some unattractive suburbs, sit on the edge of Naples itself. Not everywhere in Campania is appealing – the city of Caserta, for example, is no charmer. Litter and untidiness occasionally blight Campania’s idyll too, although great improvements have been made with these problems in recent years. 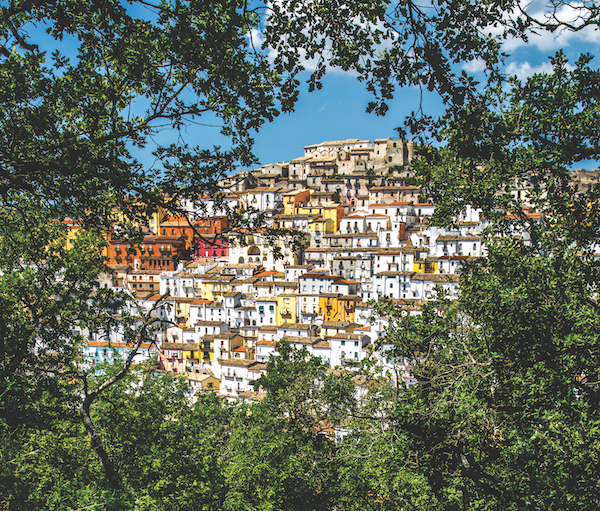 As a quintessentially southern Italian region, Campania is still thought by many non-Italians to be plagued by corruption and bureaucratic sloth – which can rather put the brakes on their rush to buy a home here. But these are largely outdated stereotypes. Campania may have a few lingering problems (like everywhere), but they are unlikely to touch your life in any way if you buy a home here. Especially in the type of places where you’re most likely to buy. And there are sound reasons to buy in those places. 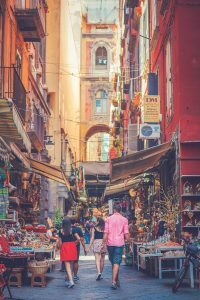 Campania’s property values are robust, and good at weathering financial uncertainty when that blows through the rest of the world. Holiday rental prospects, meanwhile, are excellent. Yes there are some expensive parts of Campania, but there are plenty of great value for money properties here too. 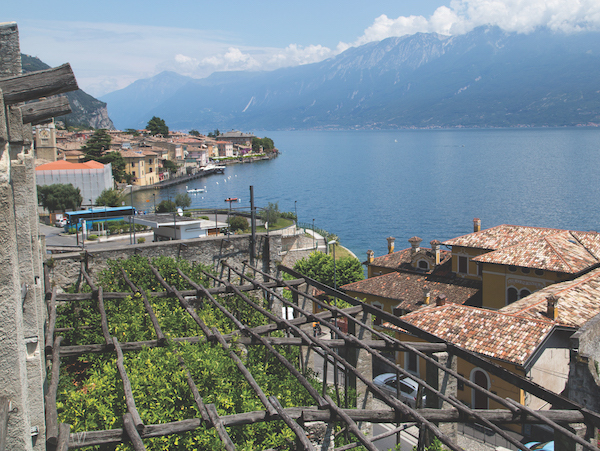 Visitor and homebuyer interest in this colourful part of Italy is perennial, and continues to increase. According to Simone Rossi of the Italian property portal Gate-away.com, requests for property for sale in Campania increased by more than 30 per cent in the first semester of 2018 compared to the same period in 2017. This interest is reflected in the region’s gently rising prices. As befits a region naturally inclined to extremes, Campania contains some of Italy’s most deliciously desirable tourist destinations and some of its least-visited locales. Likewise, the region has some of the country’s most expensive homes, and some of its cheapest. 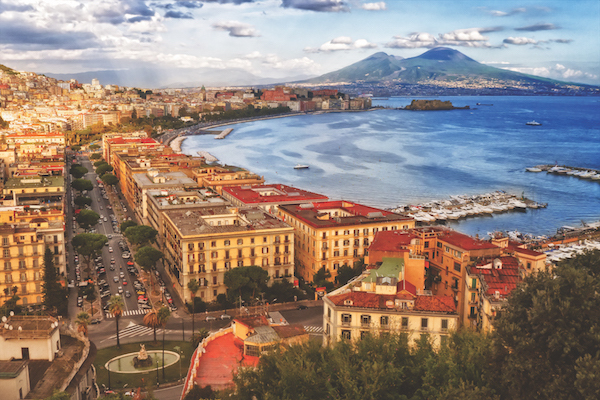 To make some sense of all this, it’s useful to divide Campania into four distinct markets: 1. the expensive bits of seaside, 2. the more affordable bits of seaside, 3. the inland territory and 4. the city of Naples. Each of these four areas has its advantages and appeals to a different kind of buyer. Buyers with smaller budgets hoping for a home on Campania’s gorgeous seaside should investigate the Cilento coast (south of Amalfi). Cilento is an area of charming small towns and lovely beaches. Its hinterland rises quickly into hills and mountains, and much of the area has been declared national parkland. Cilento has much of the geographical drama of the Amalfi Coast, but it’s a tad more rustic and undeveloped, with less glitz and brightly-painted romance. New building is restricted, which means homes hold their value very well. 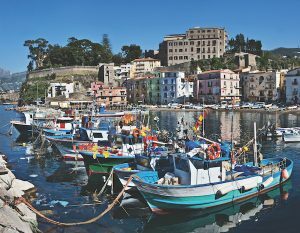 Simone Rossi recommends the Cilento coast’s beauty and value for money, and reports an increase in the requests for property here in 2018. Note that in Cilento, as across most of Italy, property prices go down in inverse proportion to altitude and/or distance from the sea. This has often worked out well for British buyers, who tend to prize a view, and who generally get a wider one by buying slightly inland and higher up. The third of our four markets named above is the very lowest-priced part of Campania, its inland hills and mountains, where a property can cost less than a third of its equivalent elsewhere. As a region with such stupefying coastal beauty, perhaps it’s no surprise that few visitors have ventured far from the sea. Inland Campania is little known to tourists, and it’s also relatively thinly populated. There are some very handsome old villages up here, to be certain. Some are half-abandoned, with empty homes representing some interesting investment opportunities. Other villages, meanwhile, are full of life and make great places to live. For example, hilltop cutie Calitri, about 35 miles from the sea, has proven popular with foreign buyers over the past decade. Prices here start at around €10,000 for a small house to be restored, and €30,000 for a ready-restored home. By day, Naples fizzes with life and erupts into singing, and at night it explodes into fireworks. No one can ever tell you what for. Because so many people want to live in Naples, housing is in great demand – which means high property prices and very good rental returns. Central two-bedroom apartments go for about €200,000-€300,000, and for much more in the swanky Vomero and Posillipo districts. Rental clientele include short-term holidaymakers and longer-term students, locals and business people. Many foreign buyers in Italy dream of restoring an old tumbledown home and tailoring it to their ideal specifications. While properties to restore are rare in Campania’s most famous locations, there’s no shortage of them on the lesser-known stretches of coast – and there’s a positive abundance of them inland. If your dream is to bring an old property back to life and imprint your own taste upon it, Campania is a good bit of Italy to consider. But doesn’t the relaxed southern Italian attitude mean you’ll endure a frustratingly slow pace on any building work? Nah, not at all. Property restorers in Campania report no longer waiting times for things to get finished than anywhere else in Italy. If you’re buying a rural home to restore, be sure to have its land deeds checked thoroughly before handing over your deposit. Occasionally other family relatives have a claim to different parts of the land, and you’ll need to know something like that in advance! Also, like everywhere in Italy, if you’re restoring any home built before the 1980s, you are legally required to incorporate earthquake-proofing in the structure if it isn’t there already. Your builders will know all the appropriate techniques to strengthen walls and so on. Make sure you protect your beautiful new home from any risk of unsightly cracks appearing in the walls. Whether you buy and restore an old country ruin, snap up a sweet village house, go for a plush seaside villa or invest in a stylish Naples apartment, you’re certain to fall under the unique spell of Campania. There is a special vividness, energy and magic to this region that’s impossible to ignore. Geographically blessed, the region is made even more irresistible by the Campanians themselves – tirelessly friendly, hospitable and enthusiastic people who can seem larger than life. Campanians have been warmly welcoming visitors for centuries, and they’re extremely good at it. For a more detailed break-down of Campania’s different areas, our Regional Property Guide is a must-read.